When I was a kid, it was always a treat when we’d get a jar of apple butter. I would spend every waking second spreading it on anything edible. I just ate and ate until I popped, or the jar was empty, whichever came first. I haven’t had it in years, but when I thought of Fall recipes it was the first thing that came to mind. I figured I should have a go at making a rather decadent version. The result is something truly scrumptious. 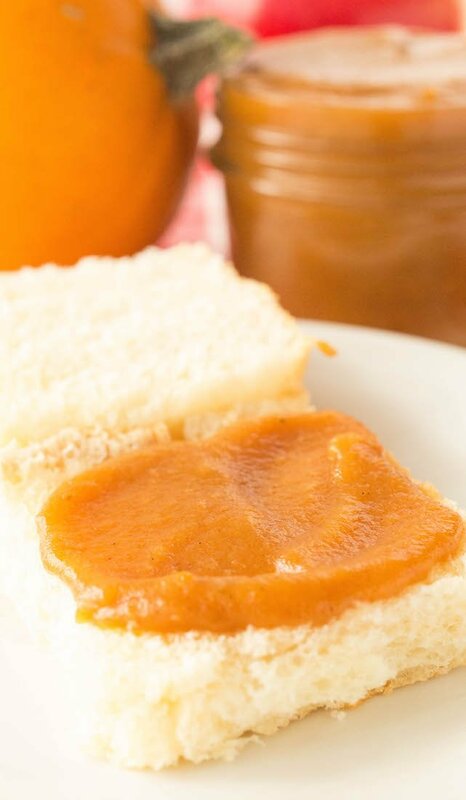 I might even go as far to say this pumpkin apple butter is the tastiest thing I’ve ever made for this blog. Seriously! One of the best things about this apple butter is that it cooks in the crock pot with almost no work from you. It takes about 12 hours to complete the process. Lucky you, because your house just fills up with the most wonderful scents of Fall allllll day. Glorious. To take this apple butter to the next level, I added a few special ingredients. First of all, I used Honeycrisp Apples, which are undeniable the absolute best apple. They’re very sweet, with the perfect crunchy texture. Once you eat Honeycrisp, you don’t go back! I knew they would give my apple butter the best flavor and didn’t even consider another variety. I also added organic pumpkin puree to give it even more Fall flavor. Then, I threw in a vanilla bean, because vanilla makes everything better. I made several batches and have some other recipes I am making with the leftovers like a pork tenderloin sandwich, ice cream, and even cinnamon rolls. 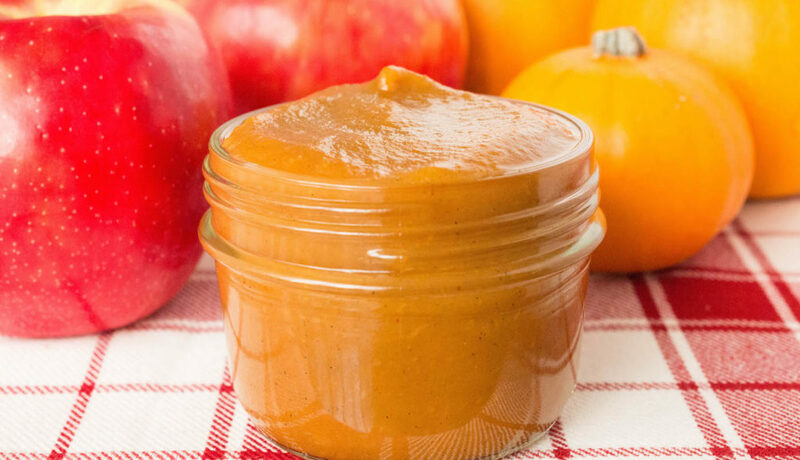 How do you like to eat your pumpkin apple butter? Do you do anything special with the leftovers? Dice the Honeycrisp apples and place them in your crock pot along with the apple juice, cane sugar, and cinnamon. Cook on low for 8 hours, stirring occasionally. When finished, you can move onto the next step, or store the sauce in the refrigerator until you are ready. 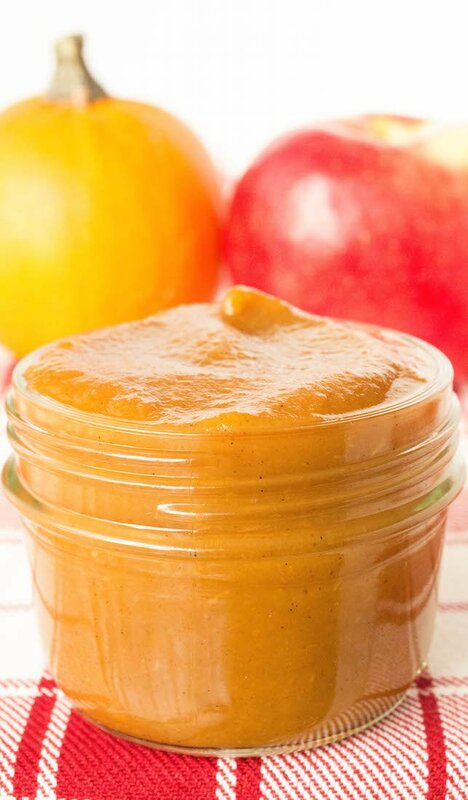 Puree the applesauce mixture in a bender or food processor. Add the sauce back to the crock pot. Add the pumpkin, pumpkin pie spice, vanilla bean, and lemon juice. Stir to combine. Cook on low for 4-6 hours, stirring occasionally. The butter is ready when it has been reduced by about 25% and is a darker color. Store in airtight jar in the fridge. It is good for 4-6 weeks. How much finished product does this make?